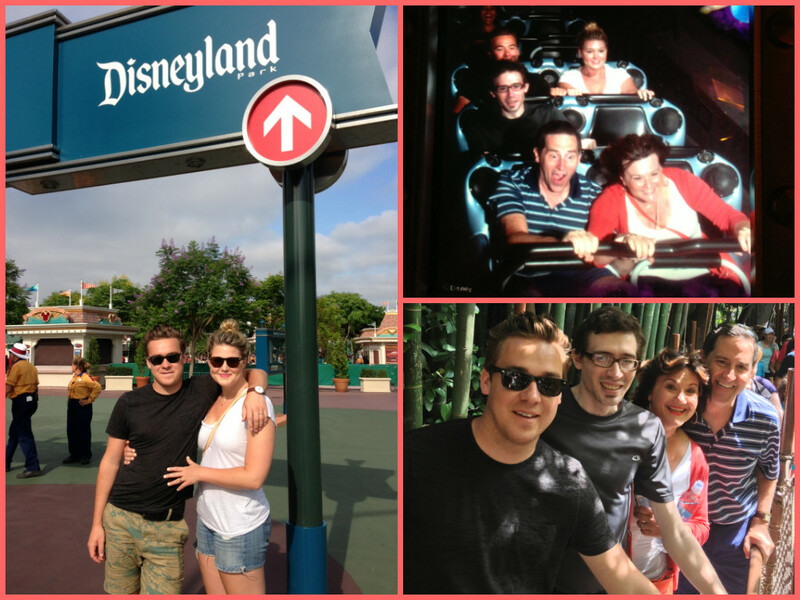 Our son-in-law Luke, daughter Rachael, son Nathan, my husband Rob and I enjoying our day at Disneyland! After a wedding in Malibu a few weeks ago, we headed to “the happiest place on earth” with our now grown family and new son-in-law. This photo of us on Space Mountain reveals just how fully immersed we were in the experience and how much fun we were all having! As we enjoyed the rides, shops, parade, lightshow and 4th of July fireworks in the evening, I realized that just how much Disneyland epitomizes excellence in what is known as “the customer experience”. Everything is intentional. And I mean everything! From the minute you walk into the park, you are seamlessly transported into another world. Happy music begins before you even buy your tickets; those who check your handbag before you enter the park are friendly, the landscape is perfect and colorful and suddenly your work worries and the LA traffic you endured to get to the park are distant memories. While waiting in line for the rides (even with the Fast Pass) it’s clear the designers meticulously planned how to engage and entertain you; immersing you in the experience of a Star Wars space flight, a Matterhorn bobsled or adventures with Indiana Jones. The décor includes small details that put YOU in the theme of the ride. It was amazing. Even the garbage containers are color coded and designed to match the “land” you are inhabiting. As a customer, it was, for 1 day and evening, all about us and OUR experience. It was interesting to compare this to a customer experience I had a week before when my PC malfunctioned – again. Two days before we left on vacation, a fairly new laptop that I use to run my business just crashed. We weren’t sure everything was backed up – and though we found most of it was saved it was a nightmare. This was also the third time this has happened to me with a fairly new PC laptop. When we took it to Best Buy/ Geek Squad it was a case study in “how not to do the customer experience”. Though there was only 1 other customer at a very long counter, we waited for at least 10 minutes. Finally a guy asked if we needed anything. Oh – sort of! Then he handed us off to a young woman who was either not trained or not awake. She then informed us that it would be $300 – but that wouldn’t guarantee that this would fix anything. Basically $300 to tell us what was wrong. When I asked about retrieving my data, she responded that the only option was to send the hard drive by mail for up to $1000. Again – no guarantees. It was a hot day and my temperature was rising too! NOTHING about the experience was about my crisis, my needs and how we were served (or not). Finally, I looked at my colleague who was helping me through this nightmare and we both said “time to head to the Apple store”. The moment we stepped into the Bridgeport Oregon store it was like “the Disneyland” of computers. It had beautiful lighting – the Best Buy was dark, worn and unfriendly. A happy, upbeat buzz. And devices that just begged you to “touch me, experience me, buy me, take me home”! We had attentive and educated help. They answered my questions without seeming annoyed that I didn’t know everything ( my usual experience with PC folks). I was managing my cash flow since I was about to leave on vacation – as any small business person does – and in 5 minutes I was approved for a no interest credit card and my purchase was made with no hassle, feeling like they actually wanted to help me! It made me ponder how I deal with clients. How is their customer experience? Are they at the core of all I do? Do I examine how they feel? Is everything I do intentionally focused on them. Honestly – I’m inspired by both Disneyland and Apple. I’m going to re-read a classic Harvard Business Review article that based on the best selling business book – The Experience Economy: Work is Theater & Every Business a Stage and rigorously examine what I can shift to enhance my customers experience. I’d love to hear your thoughts on what you’ll do to make it ALL about your customer! I love how you turned your experience in Disneyland and Apple into an inward-looking search for how you can improve your service to your customers. I find it a touch ironic, only because my memory of Disneyland makes me happy to never return. I’m not particularly sure why – maybe too much artificial happy stuff? However, when I think of you and your services, I get a feeling of genuine love of your work, and genuine desire to help your clients have a better life. It makes it such that I always look forward to opportunities to share time with you!